The Fight Light gear line is constructed of lighter 500 denier Cordura, compared to the 1000 denier material of our regular gear, with strategic reinforcements and flame resistant lining so that it still holds up to whatever punishment you can dish out. The Fight Light Multi-Tool Pouch is designed to hold regular size multi-tools or folding knives. The pouch can also hold one pistol magazine when security is more important than speed. The flap is secured by an adjustable Fastex buckle. 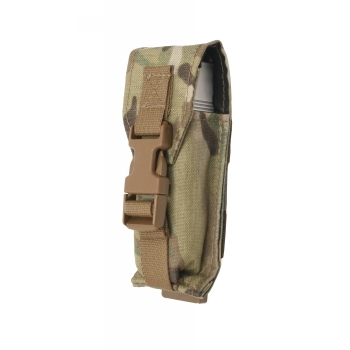 Attaches to MOLLE/PALS style webbing with one short MALICE Clip® (included).